This 25-story downtown Minneapolis hotel is located 1 block from Nicollet Mall, 2 blocks from the Minneapolis Convention Center, and 10 miles from the Mall of America. 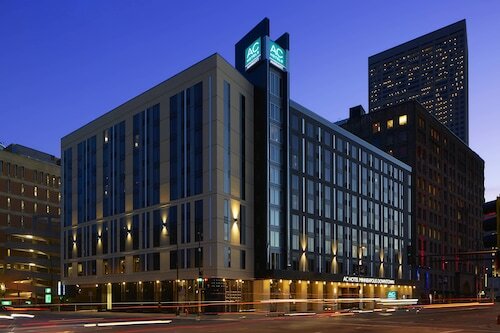 Linked by skyway to the convention center, this hotel is adjacent to Nicollet Mall, downtown's main shopping artery, and 9 blocks from the Warehouse entertainment district and Hennepin theater district. Situated amid the retail and dining of Nicollet Mall, this downtown Minneapolis hotel is 8 blocks from the theater and entertainment districts. The University of Minnesota is less than 4 miles away. This 17-story downtown hotel is 2 blocks from the Target Center concert venue and the Theater District. It links via the Skyway System to shops, restaurants, businesses, and entertainment. Located in Downtown Minneapolis, this hotel is steps from State Theatre, Target Center, and Nicollet Mall. Skyway Theatre and Orpheum Theatre are also within 5 minutes. Warehouse - Hennepin Station is 6 minutes by foot and Nicollet Mall Station is 9 minutes. Located in Downtown Minneapolis, this hotel is within a 10-minute walk of Minneapolis Convention Center and Nicollet Mall. Target Center and U.S. Bank Stadium are also within 1 mi (2 km). Government Plaza Station is 11 minutes by foot and Metrodome Station is 16 minutes. Located in Downtown Minneapolis, this hotel is within a 15-minute walk of Target Center, U.S. Bank Stadium, and Minneapolis Convention Center. Orpheum Theatre and Mill City Museum are also within 15 minutes. Government Plaza Station is only a 5-minute walk and Metrodome Station is 8 minutes. 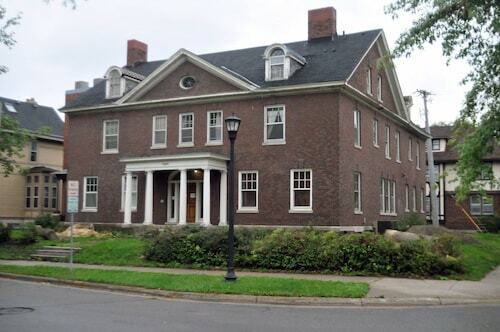 Located in Downtown Minneapolis, this hostel is within 1 mi (2 km) of American Swedish Institute, Minneapolis Convention Center, and Minneapolis Institute of Arts. Nicollet Mall and Walker Art Center are also within 1 mi (2 km). Government Plaza Station is 29 minutes by foot. The Best Western Plus The Normandy Inn & Suites is three blocks from Nicollet Mall, 6 blocks from the Minneapolis Orchestra Hall and US Bank Stadium, and 9 blocks to Target Field. 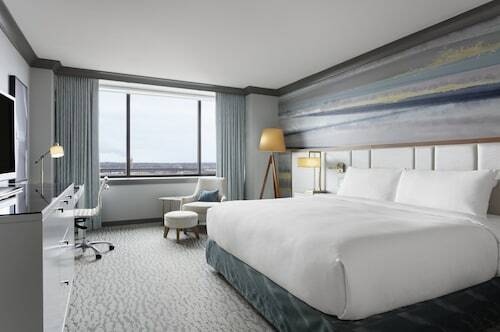 This ultra-contemporary hotel is located in the Block E entertainment complex, across from the Target Center, home of the NBA Timberwolves, and 1 block from the IDS Center. 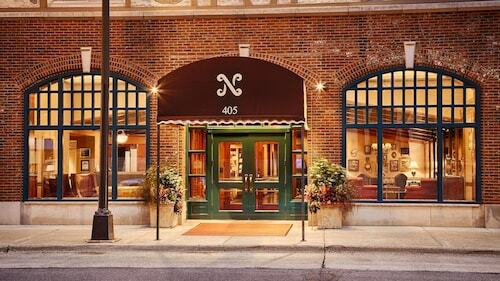 Located in Downtown Minneapolis, this hotel is within a 5-minute walk of Nicollet Mall and Skyway Theatre. Target Center and Target Field are also within 10 minutes. Warehouse - Hennepin Station is only a 2-minute walk and Nicollet Mall Station is 4 minutes. 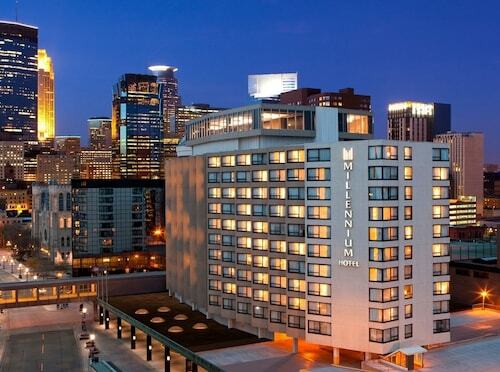 Located downtown, DoubleTree Suites by Hilton Minneapolis is an 8-minute walk from Minneapolis Convention Center. Nicollet Mall is 1 block away, and guests can walk to the Hennepin Theater District in 7 minutes. The Mall of America is a 15-minute drive, and Eat Street is only a mile from the hotel. Discover a center of imagination and culture at Minneapolis Institute of Arts. Minneapolis - St. Paul, the city where it's located, is a well-loved place to visit at any time of the year. Travelers who would like to spend their nights within an easy commute of Minneapolis Institute of Arts will find about 26 accommodation options to select from. The Hotel Ivy, a Luxury Collection Hotel, Minneapolis and the Residence Inn By Marriott Minneapolis Downtown are two places and they're only 0.9 miles (1.4 kilometers) and 1 mile (2 kilometers) away. You may also consider the Loews Minneapolis Hotel, situated 1 mile (2 kilometers) away. It shouldn't take you too long to realize the value of the area's budget hotels. A couple of your choices are the Days Inn Hotel on University and the University Inn. The selection of hotel options available here will please even the most worldly traveler. Leave your stress in the street and kick back in style! The Le Meridien Chambers, Minneapolis is one of the best places, 1 mile (2 kilometers) away. Alternatively, consider the W Minneapolis - The Foshay, 1 mile (2 kilometers) away. When you need to maintain your stamina for everything on your to-do list, schedule a stop at Art's Cafe (2400 3rd Avenue South, Minneapolis). The Copper Hen Cakery & Kitchen (2515 Nicollet Avenue, Minneapolis) is a fabulous venue to spend an evening at the end of the day, and you can find a wide selection of beers and wines. Add a creative element to your trip by attending a play at Childrens Theatre Company. No matter how many enjoyable activities you take part in while you are in this community, some time spent at Minnesota College of Art and Design will truly show you the spirit of the youth here. History may not always come alive in lecture auditoriums, but the exhibits at Hennepin History Museum make learning an authentic experience for all guests. A day at American Swedish Institute is an excellent way to be alone with your thoughts in a relaxing setting. On your adventures, you should stop and admire Music Box Theatre, a local place of worship. If you hope to view this church from the inside, make sure you make inquiries for visiting times before your trip. How Much is a Hotel Room in Minneapolis Institute of Arts? Hotels in Minneapolis Institute of Arts start at $65 per night. Prices and availability subject to change. Additional terms may apply.